Rory McIlroy MBE (born 4 May 1989) is a professional golfer from Northern Ireland who is a member of both the European and PGA Tours. He was world number one in the Official World Golf Ranking for 95 weeks. He is a four-time major champion, winning the 2011 U.S Open, (setting a tournament record score of −16), 2012 PGA Championship (with a tournament record margin of victory (8 strokes)), 2014 Open Championship, and 2014 PGA Championship. Along with Jack Nicklaus, Tiger Woods, and Jordan Spieth, he is one of four players to win three majors by the age of 25. McIlroy had a successful amateur career, topping the World Amateur Golf Ranking for one week as a 17-year-old in 2007. Later that year, he turned professional and soon established himself on the European Tour. He had his first win on the European Tour in 2009, and on the PGA Tour in 2010. In 2011 at the age of 22, he became the youngest player ever to reach €10 million in career earnings on the European Tour. In 2012, he became the youngest player to reach $10 million in career earnings on the PGA Tour. McIlroy has represented Europe, Great Britain & Ireland, and Ireland as both an amateur and a professional. At the Ryder Cup, he played for Europe against the United States in 2010, 2012, 2014, 2016, and 2018, with Europe winning in 2010, 2012, 2014, and 2018. For his individual and team achievements he has twice been named RTÉ Sports Person of the Year, in 2011 and 2014. Born in Holywood, County Down, Northern Ireland, McIlroy is the only child of Rosie (née McDonald) and Gerry McIlroy. He attended St. Patrick's Primary School and then Sullivan Upper School. He was introduced to golf at an exceptionally young age by his father, who coached him. Gerry McIlroy is a fine golfer himself, who once played at a scratch handicap level. He asked his father virtually every day to take him to Holywood Golf Club. Family lore relates that he received a new golf club as a present, being shown the correct grip by his father, then taking the club to bed with him that night, with his hands holding the club properly. McIlroy joined Holywood Golf Club and became the youngest member at the club at age seven. A video on golf technique produced by champion Nick Faldo was his early favourite. McIlroy's father held down several jobs to earn additional income for his son's golf development. His mother worked extra shifts at the local 3M plant. McIlroy's first significant international victory came in the World Championship for the 9–10 age group bracket at the Doral Golf Resort & Spa in Miami, Florida. He learned his early golf at the Holywood Golf Club, which he still retains as his home course. He started his early training with Michael Bannon, previously the Golf Professional of Holywood Golf Club, who is also his current coach and dedicated mentor. At the age of 15, McIlroy was a member of Europe's winning 2004 Junior Ryder Cup team; the event was held in Ohio. In 2005, McIlroy became the youngest-ever winner of both the West of Ireland Championship and the Irish Close Championship. He retained the West of Ireland Championship in 2006 and followed that up with back-to-back wins at the Irish Close Championship. In August 2006, he won the European Amateur at Biella Golf Club, near Milan, Italy, with the score of 274. In late 2004, at age 15, he signed a letter of intent to play collegiate golf at East Tennessee State University, but after his wins in 2005, he decided to forgo the golf scholarship and continue to play amateur golf in Europe. McIlroy shot a bogey-free opening round of 3-under-par 68 at the 2007 Open Championship at Carnoustie, his first major championship entry. He shot +5 overall and was the highest finishing amateur, winning the silver medal. In July 2005, at age 16, McIlroy shot a new competitive course record score of 61 on the Dunluce links of Royal Portrush Golf Club. In October 2006, McIlroy represented Ireland in the Eisenhower Trophy, which is the Amateur World Team Championship. On 6 February 2007, he became the second man to top the World Amateur Golf Ranking, though he lost the top spot after just one week. McIlroy was part of the Great Britain & Ireland team at the 2007 Walker Cup, held at the Royal County Down Golf Club. On the first day of the event he was paired with Jonathan Caldwell for morning foursomes, and the match was halved. In the afternoon he faced Billy Horschel in singles, but Horschel won 1 up. On the second day McIlroy and Caldwell lost in morning foursomes by the score of 2 & 1. In the afternoon he faced Horschel in singles again, and this time he won by the score of 1 up. McIlroy's overall record was (1–2–1) in Win-Loss-Tie format. The United States came out victorious by a score of 12½ to 11½. McIlroy made his first appearance in a European Tour event a few days after turning 16, when he took part in the 2005 British Masters. He made the cut on the European Tour for the first time as a 17-year-old at the 2007 Dubai Desert Classic, where he had to forego prize money of over €7,600 due to his amateur status. At the 2007 Open Championship, held at Carnoustie, McIlroy was awarded The Silver Medal as the leading amateur. McIlroy turned professional on 18 September 2007, the day before the Quinn Direct British Masters. He signed with International Sports Management. At the Quinn Direct British Masters, McIlroy shot 290 (+2), which put him in a tie for 42nd place. He finished in 3rd place at the Alfred Dunhill Links Championship in October. The next week, he secured his card for 2008 by finishing in a tie for 4th place at the Open de Madrid Valle Romano. He became the youngest Affiliate Member in the history of The European Tour to earn a tour card. On the 2007 European Tour season, he earned €277,255 and finished in 95th place on the Order of Merit list. He was the highest ranked associate member. Before his season started, Tiger Woods invited McIlroy to play in the 2007 Target World Challenge, held in December, and the 2008 AT&T National, held in July. McIlroy declined the invitation, preferring to play the European Open the week of the AT&T National. McIlroy started his 2008 European Tour season at the UBS Hong Kong Open. He did not make the one-under cut. He entered the top 200 of the Official World Golf Ranking for the first time on 27 January 2008. 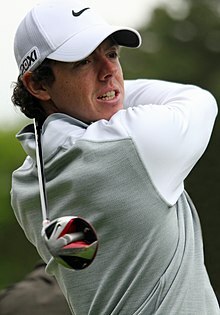 On 7 September 2008, McIlroy took a four-stroke lead into the final round of the Omega European Masters in Crans-sur-Sierre, Switzerland, but finished in a tie for first place with Frenchman Jean-François Lucquin and lost in a play-off. McIlroy finished the European Tour season in November 2008 with six top-10 placements and ranked 79th in the World Golf Ranking. After finishing second in the UBS Hong Kong Open in November 2008, McIlroy attained his highest world ranking position of 50. He finished the 2008 calendar year at 39th in the world rankings after finishing joint 3rd in the South African Open. This earned him an invitation to the 2009 Masters Tournament. His first professional win came at age 19 when he won the Dubai Desert Classic on 1 February 2009, this win took him to 16th in the world rankings. In the 2009 WGC-Accenture Match Play Championship, McIlroy reached the quarterfinals. In the first round he defeated Louis Oosthuizen 2 & 1, in the second round he beat Hunter Mahan 1-up, and in the third round he beat Tim Clark, 4 & 3. He lost to Geoff Ogilvy, who won the tournament, in the quarterfinals 2 & 1. McIlroy continued to play on the PGA Tour until May. He finished tied for 13th at the Honda Classic, tied for 20th at the WGC-CA Championship and tied for 19th at the Shell Houston Open. In April 2009, McIlroy made his first Masters Tournament appearance, his first major championship as a professional. He finished the tournament tied for 20th place, two strokes under par for the tournament. Of the players to make the cut, McIlroy achieved the third highest average driving distance, beaten only by Dustin Johnson and Andrés Romero. McIlroy played in two more events on the PGA Tour after the Masters Tournament including his first appearance at The Players Championship, where he missed the cut. McIlroy then returned to Europe and recorded two top-25 finishes leading up to his first U.S. Open. He finished fifth at the BMW PGA Championship and 12th at the European Open. McIlroy played in his second major as a professional at the 2009 U.S. Open. His final round of 68 (−2) helped him finish in a tie for 10th, his first top-10 finish in a major. The following week, McIlroy finished in 15th place at the BMW International Open. McIlroy played in his first Open Championship as a professional in July and finished T-47. He finished T-3 at the 2009 PGA Championship. McIlroy finished the 2009 season ranked second on the Race to Dubai, behind Lee Westwood, and in November he entered the top 10 of the world rankings for the first time. McIlroy finished 2009 ranked 9th in the world. In November 2009, McIlroy announced that he would join the American-based PGA Tour for the 2010 season. McIlroy accepted an invitation from Gary Player to participate in the 2009 Nedbank Golf Challenge at the Gary Player Country Club at Sun City, South Africa in December, but withdrew after feeling unwell. McIlroy during a practice round of the 2010 PGA Championship. McIlroy finished 3rd at the 2010 Abu Dhabi Golf Championship. As defending champion at the 2010 Dubai Desert Classic, McIlroy shot a final round of 73 to finish in a tie for fifth place. In the 2010 WGC-Accenture Match Play Championship, McIlroy beat Kevin Na 1-up in the first round and then lost on a playoff hole to Oliver Wilson. After the Accenture Match Play Championship, McIlroy took time off from golf due to a sore back. After a two-week break McIlroy returned in the 2010 Honda Classic and finished in a tie for 40th. On 2 May, McIlroy recorded his first PGA Tour win after shooting 62 in the final round of the Quail Hollow Championship. The round set a new course record, and concluded with six consecutive scores of three. He became the first player since Tiger Woods to win a PGA Tour event prior to his 21st birthday. The win earned him a two-year Tour exemption. 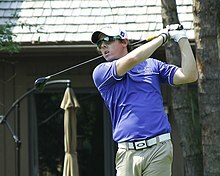 On 2 June, McIlroy played in the Memorial Skins Game at Muirfield Village Golf Club in Dublin, Ohio. McIlroy finished tied for 10th place at that same week's Memorial Tournament. On 15 July 2010, McIlroy confirmed his status as a favourite for the Open title on the Old Course at St Andrews by shooting a 9-under-par 63 on the opening day, the lowest-ever first round score in the 150-year history of the Open Championship, and tying the course record. He missed a 5-foot birdie putt on the 17th, "The Road Hole", which would have given him the outright record. His tied third finish in the 2010 Open Championship sent him to a career high world ranking of seventh. McIlroy missed out on a chance to win the 2010 PGA Championship when he three-putted the 15th green to fall out of a tie for the lead. His final-hole birdie putt narrowly missed the hole to leave him one stroke out of the playoff between Bubba Watson and eventual winner Martin Kaymer. McIlroy finished tied for third. On 4 October 2010, McIlroy won a crucial half-point to help Europe regain the Ryder Cup. Following the Ryder Cup, he announced in November that he would return to play full-time on the European Tour, although he also stated that he would continue to play 11 or 12 tournaments in the US per year. He attributed the decision to having closer friends on the European Tour, his part in the Ryder Cup victory, and wanting to be nearer his girlfriend and family. McIlroy later stated that he regretted his 2010 decision to give up his PGA Tour card, and his skipping the 2010 Players Championship at TPC Sawgrass. McIlroy's manager Chubby Chandler's aversion to the PGA Tour was cited by McIlroy as one of the main reasons for their later professional split. On 7 April, McIlroy shot a bogey-free 7-under-par 65 in the first round of the Masters Tournament in Augusta, Georgia to take the lead after the first day of the four-day competition. At the time, he was the youngest player to lead the Masters Tournament at the close of the first day. On Friday, he shot 69 to lead by two strokes over Jason Day with a 10-under-par score. On Saturday, he shot 70 to finish at 12-under-par, four strokes ahead of four other challengers. However, on the fourth and final day, he shot the worst round in history by any professional golfer leading after the third round of the Masters Tournament. McIlroy scored one-over-par 37 on the first nine, and still had the lead, but shot a round of 80, finishing T15 at 4-under for the tournament. McIlroy failed to make the cut in his title defense at Quail Hollow in early May, was well off the pace at the BMW PGA Championship. He held the 18 hole lead at the Memorial Tournament but finished in 5th place. After his memorable fourth round collapse at the Masters in early April, it would not take long for McIlroy to fully redeem himself on the major championship stage. On 19 June 2011, McIlroy amazed the golfing world in capturing his first major championship victory with a mesmerizing performance at the U.S. Open at Congressional in Bethesda, Maryland. McIlroy's level of play was unrivaled throughout the week, and his dominance of play is evidenced by his 8-stroke margin of victory over 2nd-place finisher Jason Day. McIlroy set several records in his victory, most notably, his 72-hole aggregate score of 268 (16-under) was a new U.S. Open record. The 268 aggregate beat the previous record of 272 held by Jack Nicklaus (Baltusrol, 1980), Lee Janzen (Baltusrol, 1993), Tiger Woods (Pebble Beach, 2000), and Jim Furyk (Olympia Fields, 2003). The 16-under in relation to par beat Tiger Woods' 12 under at Pebble Beach Golf Links in 2000. He became the youngest winner since Bobby Jones in 1923. The victory lifted McIlroy's position in the Official World Golf Ranking to a then career high of number four. On 17 June, during the second round of the US Open, McIlroy would become the first player in the history of the championship to reach a score of 13-under-par at any point in the tournament. He achieved the feat by making birdie at the 17th hole in the second round. Despite a double bogey on the final hole, his two-day total of 131 (65-66, 11-under-par) set a championship scoring record as the lowest 36-hole total in U.S. Open history. The score was one better than Ricky Barnes' 132 in 2009. He was also the fastest golfer to reach double digits under par in the U.S. Open, reaching 10 under par in 26 holes. On 18 June, during the championship's third round, he became the first player to reach 14-under par at the tournament by making a birdie at the 15th hole, and would finish the round off to capture the 54-hole U.S. Open scoring record, posting a 3-round total of 199 (-14). In doing so, he also built an eight-stroke lead going into the final round. A final round of 69 allowed him to claim his first major championship setting the 72-hole record. McIlroy took a month off from competitive golf. At The Open Championship he struggled in tough weather over a difficult layout at Royal St George's Golf Club, failing to contend with the conditions. He was again a non-factor at the PGA Championship at Atlanta Athletic Club after injuring his wrist on the 3rd hole of the first round after attempting to play a stroke from behind a tree root. McIlroy went on to win the Lake Malaren Shanghai Masters in a playoff against Anthony Kim. In November, he finished tied for 4th at the WGC-HSBC Champions to move to a then career high of number two in the Official World Golf Ranking. In December 2011, he won the UBS Hong Kong Open by two strokes. McIlroy's first tournament of the year was at the Abu Dhabi HSBC Golf Championship during the desert swing of the European Tour at the end of January. The tournament was in the spotlight due to its high-profile field including Tiger Woods, Luke Donald and Lee Westwood. McIlroy played alongside Woods and Donald in the marquee group during the first two days. McIlroy shot rounds of 67-72-68 to start round 4 in joint 3rd place behind joint leaders Robert Rock and Tiger Woods. He shot a 3-under-par 69 on Sunday to finish lone second, one stroke behind winner Robert Rock. At the Omega Dubai Desert Classic McIlroy finished tied 5th on 14-under-par, four strokes behind winner Rafael Cabrera-Bello. He continued to play well at the WGC-Accenture Match Play Championship in Arizona where he won matches against George Coetzee, Anders Hanson, Miguel Ángel Jiménez, Bae Sang-moon and Lee Westwood before losing to Hunter Mahan in the final. After 10 holes in the final match, McIlroy was 4 down to Mahan, but cut the deficit to 2 down through 16 holes. The 17th hole was halved with pars, securing the win for Mahan. There was anticipation surrounding the semi-final match between McIlroy and Westwood, as the winner would become the number one golfer in the world if they also won the final. McIlroy's runner-up finish moved him up to number two in the world while also putting him at the top of the Race to Dubai leaderboard. The following week, McIlroy continued good form and won the Honda Classic in Palm Beach Gardens, Florida, and with it claimed the Number 1 spot in the world rankings. He started the fourth round in first place at 11-under-par after rounds of 66-67-66, ahead of a chasing pack including Tiger Woods, Lee Westwood and Keegan Bradley. McIlroy shot a final round of 69 to claim his third PGA Tour title and finished two strokes ahead of Tiger Woods and Tom Gillis. McIlroy became the second youngest World Number 1 and moved up to fourth place in the FedEx Cup standings. McIlroy played the following week at the WGC-Cadillac Championship in Miami, Florida. His recent good form began to dwindle slightly on Thursday, when he shot a 1-over par 73. However, he shot 69 and 65 the next two days to begin the fourth round in tied 8th place. Going into the back 9 on Sunday, he had a chance of winning his second title of 2012 in as many weeks due to the leaders faltering. However two late bogeys halted his chance and he settled for 3rd place, two strokes behind winner Justin Rose. McIlroy lost his number one ranking on 18 March to Luke Donald after Donald won the Transitions Championship. McIlroy was one stroke off of the lead going into the weekend at The Masters but struggled in his last two rounds and finished in a tie for 40th. He regained the top spot in the world rankings on 15 April but lost it to Donald again on 29 April. On 6 May, McIlroy was in contention at the Wells Fargo Championship and went to a playoff with Rickie Fowler and D. A. Points. Fowler won the tournament on the first playoff hole with a birdie. The runner-up finish put McIlroy back at the top of the Official World Golf Ranking. After the runner-up finish, McIlroy would later miss the cut in his next three events, and fell again from number one ranking. On 12 August 2012, McIlroy won the 2012 PGA Championship at Kiawah Island (Ocean Course) in South Carolina. McIlroy would win by eight strokes, setting a margin-of-victory record for the PGA Championship with a birdie on the final hole. The record stood since Jack Nicklaus won the 1980 PGA Championship by seven strokes. McIlroy started the final round with a three stroke lead and shot a flawless, bogey-free 66 to run away from the field. At the time, Rory's win at 22 years-old made him the youngest multiple major champion since Seve Ballesteros won the 1980 Masters Tournament. McIlroy's win also regained him the world's number one ranking. McIlroy finished the regular season third in the FedEx Cup standings. At The Barclays, the first of four playoff events, he finished in a tie for 24th, dropping him to fourth in the standings. McIlroy won the following week at the Deutsche Bank Championship to take the top spot in the standings. McIlroy entered the final round three strokes behind Louis Oosthuizen and defeated him by one stroke. The win also put McIlroy at the top of the PGA Tour money list. McIlroy's success continued the following week when he won the BMW Championship. He was 40-under par for his two playoff tournament victories. With the win, he became the first European to win four PGA Tour events in a single season and the only person other than Tiger Woods to win four events in a season since 2005. McIlroy topped the qualification standings for the 2012 Ryder Cup. He picked up three points for the European team, partnering with Graeme McDowell in two foursomes and one fourballs match, and with Ian Poulter in the second day fourballs. On the final day, a mix up with his tee time meant that he arrived only 12 minutes before he was due to tee off, after being escorted in by a police officer. He defeated Keegan Bradley 2&1 to help Europe win 13½-14½. Following Europe's victory in the Ryder Cup, McIlroy turned his attention to winning the Race to Dubai. A second place at the BMW Masters was followed by a third place at the Barclays Singapore Open to wrap up the title with two events remaining. To finish off his season, he won the DP World Tour Championship, Dubai, making birdie on the last five holes to beat Justin Rose by two strokes. He thus duplicated Luke Donald's 2011 feat of winning both the PGA Tour and European Tour money titles in the same year. McIlroy during a practice day for the BMW PGA Championship in 2013 at Wentworth. McIlroy began 2013 with high aspirations, but mostly did not fare well in early tournaments. Struggling with the equipment change having signed a large endorsement deal with Nike in January, he withdrew from the Honda Classic in February, and finished in two over par and in a tie for 25th place at the 2013 Masters Tournament. McIlroy won the 2013 Emirates Australian Open on the 72nd hole. He beat Australian Adam Scott by one stroke. In January, McIlroy was hit with a two-shot penalty for not taking proper and full relief after driving onto a spectator pathway in the Abu Dhabi HSBC Golf Championship, his first event of the season. He was alerted to his mistake by Scottish caddie Dave Renwick after his round and, after signing for a 70 instead of a 68 to reflect the penalty, he told reporters: "There are many stupid rules in golf and this is one of them." The two-shot penalty ultimately cost him dearly, as he lost the tournament by a single shot. In March, McIlroy lost in a four-man sudden-death playoff at the Honda Classic on the PGA Tour, despite leading the tournament through all four rounds until the back nine on Sunday. He shot a final round 74 (+4) and had a superb second shot to the par-five 18th in regulation play to qualify for the playoff, after missing the eagle putt for the win. He lost on the first extra hole, when Russell Henley was the only one of the four to birdie the hole. In May in England, McIlroy won the BMW PGA Championship at Wentworth by one stroke. He carded a six-under-par 66 final round to beat Thomas Bjørn, who started the day seven strokes clear of McIlroy. The win was McIlroy's first on either of the two major tours in 18 months. A week after winning his first-ever WGC event at the WGC-Bridgestone Invitational, McIlroy would edge runner-up Phil Mickelson by one shot to collect his fourth major championship victory with a win at the 2014 PGA Championship at Valhalla in Louisville, Kentucky. After McIlroy's victory at his own Nicklaus-designed Valhalla Golf Club, golfing great Jack Nicklaus said of McIlroy: "Rory is an unbelievable talent. I think Rory has an opportunity to win 15 or 20 majors or whatever he wants to do if he wants to keep playing. I love his swing." McIlroy's second tournament of the year yielded victory as he won the European Tour's Omega Dubai Desert Classic for a second time. With a score of 22-under-par, matching the record set by Stephen Gallacher and Thomas Bjørn. He missed the cut in his first start of the PGA Tour season at the Honda Classic. It was his first missed cut on the PGA Tour since the 2013 Open Championship, a streak of 22 consecutive events. He finished fourth at the 2015 Masters Tournament, his best career Masters finish. On 3 May, he won the WGC-Cadillac Match Play event held at TPC Harding Park in San Francisco. This is his second World Golf Championship. In the process becoming only the third player behind Tiger Woods and Jack Nicklaus to win 10 PGA tour events and four majors by the age of 25. On 16 May, while playing in the Wells Fargo Championship, McIlroy shot a course-record 61 at the Quail Hollow Club in Charlotte, North Carolina. He went on to win the championship for a second time, by 7 strokes with a tournament record score. This was his 2nd win in three straight events. McIlroy's tough schedule eventually caught up with him as he missed the cut at his next two events. First at the BMW PGA Championship, he opened with an average one-under-par 71 but faded the next day to a 6-over 78. He claiming mental fatigue got the better of him and not its physical counterpart. The following week at the Irish Open, McIlroy shot a first round 80 to lie 9-over and in a tie for last place. The following day he managed a level-par 71 around Royal County Down which left him 4 shots off the halfway cut. McIlroy stated he had left himself too much to do after a poor Thursday performance in front of his home Northern Irish fans and at the event he now hosts. He later said he was looking forward to a break after five tournaments in a row. Just a little over a week prior to The Open Championship McIlroy injured his left anterior talofibular ligament (ankle ligament). This led to him missing the tournament and the subsequent WGC-Bridgestone Invitational. He made his return in the 2015 PGA Championship and made the cut finishing in 17th place. Going into the final tournament of the European Tour season, the DP World Tour Championship, Dubai, McIlroy was leading the Race to Dubai standings. However six other players were in contention for the season end prize going into the event, with Danny Willett being the closest challenger. McIlroy posted a score of 21 under to win the tournament by a single stroke from Andy Sullivan. This was his second victory in the lucrative year end tournament and his third Race to Dubai title in four years. Following these successes McIlroy was awarded the European Tour Golfer of the Year Award, this was his third win of the award. Chasing his first win of the year, McIlroy took a three-shot lead into the final round of the WGC-Cadillac Championship at Doral, but faltered with a two-over-par 74 to finish two shots behind winner Adam Scott. At the 2016 Masters, McIlroy was in the final group in the third round alongside Jordan Spieth but faltered to a birdie-free five-over-par 77 and followed that up with a one-under-par 71 on Sunday to finish T10. Afterwards, he said he was affected by the pressure of trying to achieve the Grand Slam. In May, McIlroy claimed his first victory of the year at his home Irish Open – a tournament hosted by the Rory Foundation. He finished three strokes clear of Russell Knox and Bradley Dredge and subsequently gave the €666,000 winner's cheque to charity. On 5 September, he won the Deutsche Bank Championship in Norton, Massachusetts (near Boston). He finished two shots clear of Paul Casey. He produced a near flawless final round of 65 to win for the first time on the PGA Tour in 2016 at the Deutsche Bank Championship. At the final event of the PGA Tour season, the 2016 Tour Championship, McIlroy overcame a two-shot deficit after the third round to force a playoff with Ryan Moore and Kevin Chappell, winning the competition at the fourth playoff hole with a birdie 3 on the par4 16th. The result put McIlroy at the top of the FedEx Cup and won him the $10 million bonus pool. At the 2016 Ryder Cup, McIlroy played five matches winning three points, all when paired with Thomas Pieters: the European duo overcome Dustin Johnson and Matt Kuchar, 3 and 2, in the Friday fourballs, Rickie Fowler and Phil Mickelson, 4 and 2, in the Saturday foursomes, and Brooks Koepka and Johnson, 3 and 1, in the Saturday fourballs. McIlroy paired with Andy Sullivan in the Friday foursomes, losing to Mickelson and Fowler, 1 up. In the Sunday singles, he lost to Patrick Reed,1 up, thanks to a birdie by the American at the last hole. At the end of 2016, Nike announced their withdrawal from the golf equipment market, releasing staff players from their contracts early. After spending several months trying different clubs and balls, McIlroy signed a $100 millon endorsement deal with TaylorMade. McIlroy did not win during 2017, but still had a solid year recording top 10 finishes at the Masters, The Open and 3 WGC events. He was hampered throughout the season by a rib injury first sustained at the BMW SA Open in January, where he lost out on the title in an playoff to Graeme Storm, and played a limited schedule as a result. After missing out on qualifying for the end of season Tour Championship on the PGA Tour, he decided to sit out the remainder of the year to rest and recover fully. McIlroy returned after more than 100 days away at the Abu Dhabi HSBC Championship in late January. Prior to the tournament, McIlroy revealed he has a slight heart irregularity but played down the impact on his golf. McIlroy finished runner-up to Li Haotong in the Omega Dubai Desert Classic. He lost out by one stroke, having led by two with five holes to play. It was his 16th runner-up finish on the European Tour and the 22nd runner-up finish of his career. On 18 March 2018, he won the Arnold Palmer Invitational with a final-round 64, his first win since winning the Tour Championship (and FedEx Cup) in 2016. In April, in his 10th appearance at the Masters Tournament, McIlroy was in contention during the final round. McIlroy and Patrick Reed teed off in the final pairing at Augusta National with McIlroy three shots behind Reed. However, McIlroy shot a 74 to finish six back of the winner, Reed, and was thus not able to take advantage of this opportunity to win a green jacket. He tied for second with a score of six-under-par at the 2018 Open Championship. In September 2018, McIlroy qualified for the European team participating in the 2018 Ryder Cup. Team Europe beat Team U.S.A. 17 1/2 to 10 1/2 at Le Golf National outside of Paris, France. McIlroy started his year on the PGA Tour in good form with five straight top-6 finishes: tied for 4th at the Sentry Tournament of Champions; tied for 5th at the Farmers Insurance Open; tied for 4th at the Genesis Open; runner-up finish at the WGC-Mexico Championship; tied for 6th at the Arnold Palmer Invitational. He subsequently won the Players Championship with a score of −16, becoming just the second British winner of the tournament after Sandy Lyle in 1987. With the win, he also joined Jack Nicklaus and Tiger Woods as the only players to win four majors and 15 PGA Tour titles before the age of 30. He is well behind their age 30 accomplishments (Nicklaus: 7 majors, 30 wins; Woods: 10 majors, 46 wins), but also has fewer PGA Tour starts due to playing on the European Tour. In 2012, besides leading the PGA Tour money list, McIlroy won the PGA Player of the Year, PGA Tour Player of the Year, Vardon Trophy, and Byron Nelson Award. In addition to winning the Race to Dubai, he was voted the European Tour Golfer of the Year. He also won the Mark H. McCormack Award for leading the Official World Golf Ranking for the most weeks in the year (28 of 52 weeks). Also in 2012, he won a Laureus World Sports Award in the category Breakthrough of the Year. In 2014, McIlroy again swept the PGA Tour awards: Arnold Palmer Award (leading money winner), PGA Player of the Year, PGA Tour Player of the Year, Vardon Trophy, and Byron Nelson Award. He also won the Race to Dubai and was voted the European Tour Golfer of the Year. He again won the Mark H. McCormack Award for leading the Official World Golf Ranking for the most weeks in the year (22 of 52 weeks). He was awarded the RTÉ Sports Person of the Year for the second time, previously winning in 2011, and the BBC Northern Ireland Sports Personality of the Year for the third time after victories in 2011 and 2012. He also came 2nd in the BBC Sports Personality of the Year award, behind Formula 1 World Champion Lewis Hamilton. In 2015 McIlroy was shortlisted for the Laureus World Sportsman of the Year. In 2015, McIlroy won European Tour Golfer of the Year for the third time (2012, 2014). McIlroy employs the interlocking grip on full shots. He has worked with various professional golfers since he was young, including Darren Clarke, Nick Faldo, and Graeme McDowell. McDowell frequently plays practice rounds at Tour events with McIlroy. McIlroy obtained putting assistance and instruction[when?] from Dave Stockton, a retired PGA Tour player who works as a putting instructor. He was first managed by Englishman Andrew "Chubby" Chandler, a former European Tour player who founded International Sports Management (ISM). McIlroy left ISM in 2011, with McIlroy joining Dublin-based Horizon Sports Management. Michael Bannon has been working with McIlroy since October 2012. In May 2009, McIlroy described the Ryder Cup as an "exhibition". McIlroy said: "It's not a huge goal of mine. In the big scheme of things it's not that important an event for me. It's an exhibition at the end of the day." McIlroy went on to say: "Golf is an individual sport. You have individual goals and my goals are to win tournaments for myself." European Ryder Cup captain Colin Montgomerie responded by saying that the contest "is not an exhibition and it never will be. It's a very unique, special event." The following year, in 2010, McIlroy said that he regretted his earlier comments and said that the Ryder Cup is "definitely not an exhibition". In May 2011, McIlroy was criticised for skipping The Players Championship. The skip was controversial because 48 of the top 50 in the world participated in it, the other golfer skipping being Lee Westwood. On 17 July 2011, following a poor showing over the weekend in the 2011 Open Championship, McIlroy told the media that he was "not a fan of golf tournaments that are predicted so much by the weather," and saying he would rather "wait for a year when the weather is nice" instead of tuning his game to prepare for the Open Championship. He also added that he would "rather play when it's 80 degrees and sunny and not much wind". On 28 July 2011, after being criticised on air by commentator Jay Townsend about McIlroy's questionable course management skills during the first round of the Irish Open, McIlroy wrote on Twitter telling Townsend to "shut up" and saying Townsend is a "failed golfer" and that "his opinion meant nothing". Later, McIlroy stood by his comments and stated that his comments were made in defense of his caddie J. P. Fitzgerald whom Townsend had been blaming for McIlroy's course management since 2008. In February 2013, McIlroy was criticised for withdrawing from the 2013 Honda Classic, citing tooth pain. Critics claimed that tooth pain was not the issue, and that McIlroy, the world number one at the time, was having difficulty adjusting to new equipment, and that he should have finished the tournament. Regarding his withdrawal, McIlroy stated, "this is one of my favourite tournaments of the year and I regret having to make the decision to withdraw, but it was one I had to make." In March 2015, McIlroy threw a club into the water at the WGC-Cadillac Championship after hitting his ball into the water on the par-5 eighth hole during the second round at Doral. McIlroy subsequently apologized for throwing the club saying "It felt good at the time but now I regret it. Frustration got the better of me." On the eve of the Open Championship in 2016, McIlroy said he would not watch the golf tournament at the Olympic Games and would focus on the sports that matter like swimming and track & field having previously withdrawn from representing Ireland in the games due to the threat of the Zika virus in Brazil. Following the tournament, McIlroy went on to admit his surprise at how successful it had been, and that he had been wrong to dismiss it. In January 2017, McIlroy said that he is unlikely to compete at the 2020 Olympic Games, stating that he considers himself a citizen of Northern Ireland, as opposed to having an allegiance with either Ireland or Great Britain. McIlroy has been cited as the most exciting young prospect in golf and as having the potential to become one of the highest earners in sports in terms of endorsements. In 2013 SportsPro rated him the third-most marketable athlete in the world (after Neymar and Lionel Messi). In January 2013 he signed a large endorsement deal with Nike, with wide speculation on its terms. Initial rumours of a 10-year/$250 million accord ratcheted down to a more likely $100 million deal of an undetermined length. In 2017, McIlroy signed a 10-year, $200 million contract extension with Nike for apparel only after Nike exited the golf equipment business, allowing him to additionally sign a 10-year, $100 million equipment deal with TaylorMade to use their clubs, ball, and bag. McIlroy was an ambassador for Jumeirah group from 2007-2012. McIlroy is the namesake for EA Sports' video game Rory McIlroy PGA Tour, replacing Tiger Woods, who had been the previous namesake for the series from 1998 to 2013. EA (Electronic Arts) transitioned from Tiger Woods to Rory McIlroy after he became the world's number one golfer in 2015. McIlroy was raised Roman Catholic and has self-identified as Irish, Northern Irish, and British. He carries a British passport, although he usually is reluctant to discuss his nationality at length. On 18 June 2014, McIlroy declared that he would represent Ireland (if he qualified) at the 2016 Olympic Summer Games, where golf became an Olympic event for the first time since 1904. In 2012 he had expressed an interest in representing Great Britain as opposed to Ireland, however in January 2013 he was considering the options of playing for Britain or Ireland or not playing at all, stating; "I just think being from where we're from, we're placed in a very difficult position. I feel Northern Irish and obviously being from Northern Ireland you have a connection to Ireland and a connection to the UK. If I could and there was a Northern Irish team I'd play for Northern Ireland. Play for one side or the other – or not play at all because I may upset too many people… Those are my three options I'm considering very carefully", before choosing Ireland in 2014. McIlroy lived near the village of Moneyreagh in County Down, about 20 minutes from Belfast. The land around his home included a custom-made practice facility and a scaled-down football pitch. In September 2012, the house was put up for sale for a price of £2 million. In December 2012, McIlroy purchased a $10 million property in Palm Beach Gardens, Florida, located close to Jack Nicklaus' The Bear's Club. McIlroy is an Ambassador for UNICEF Ireland and made his first visit to Haiti with UNICEF in June 2011. In 2014, McIlroy was also announced as an official ambassador for PGA Junior League Golf. His great-uncle Joe McIlroy was killed by the Ulster Volunteer Force in a sectarian attack at his east Belfast home in November 1972. McIlroy is a fan of Manchester United. In his acceptance speech following his 2014 Open Championship win at Royal Liverpool, McIlroy addressed the crowd by joking; "Even though I'm a Man United fan standing here," which saw him booed in jest by archrival Liverpool fans, before he thanked them for their great support. McIlroy is a fan of the Northern Ireland national team. When Northern Ireland played against world champions Germany in a Euro 2016 match, he went to Paris to attend that match. McIlory plays the sport in his spare time. He injured ankle ligaments in 2015 while playing football with friends which forced him to miss the 2015 Open Championship, but states he won't give up playing: "I’m not going to stop doing what I do. I enjoy having that normality in my life. I’ve done it since I was a kid and won’t stop.” McIlroy is a fan of Ulster Rugby and often interrupts his busy golfing schedule to attend rugby matches at Ravenhill Stadium in Belfast. McIlroy was appointed Member of the Order of the British Empire (MBE) in the 2012 New Year Honours for services to sport. According to the 2017 Forbes' list of the world's highest-paid athletes, McIlroy was the joint sixth highest paid sportsperson that year having earned US$50 million, of which $34 million came from endorsements. McIlroy filed documents to create a new company known as Rory McIlroy Inc with the Companies Registration Office in Carlow in March 2015. The new company, headed by Donal Casey, manages the royalty payments from his various endorsements. In February 2018, McIlroy appeared on an episode of Amazon Prime show The Grand Tour, racing against Paris Hilton in the 'Celebrity Face-Off' segment of the show. McIlroy dated Danish tennis professional Caroline Wozniacki from 2011 to 2014. They became engaged on 31 December 2013. On 21 May 2014, it was announced that McIlroy had ended the engagement: "The problem is mine. The wedding invitations issued at the weekend made me realise that I wasn't ready for all that marriage entails. I wish Caroline all the happiness she deserves and thank her for the great times we've had." Wozniacki later revealed that McIlroy had ended the relationship through a brief phone call, and had not contacted her since. McIlroy started dating former PGA of America employee, Erica Stoll in 2015. In December 2015, it was reported that the couple had become engaged while on holiday in Paris. They married in April 2017 at Ashford Castle in Cong, County Mayo. ^ McIlroy was not a member of the PGA Tour in 2007, 2009 or 2011 so he was not included on the money list or the scoring average list. Note that there is double counting of money earned (and wins) in the majors and World Golf Championships since they are official events on both tours. ^ "Golf ball launched into British Open crowd by Rory McIlroy now up for auction". SB Nation. Retrieved 25 March 2015. ^ Litke, Jim (3 October 2010). "'G Mac' and 'Wee Mac' help get Euros back on track". The Washington Post. Associated Press. ^ a b c "Rory McIlroy – European Tour profile". PGA European Tour. Retrieved 8 August 2013. ^ "Northern Ireland hails Rory McIlroy as its 'Celtic Tiger,' and latest golf hero". PGA of America. Associated Press. Retrieved 30 November 2011. ^ a b Hodgetts, Rob (20 July 2014). "Rory McIlroy's Open win puts him on the path to superstardom". BBC Sport. ^ a b Breen, Suzanne (26 June 2011). "And the real winner is ... peace: How Belfast superstar Rory McIlroy refused to let himself be defined by his family's religion". Daily Mail. London. Retrieved 18 July 2011. ^ Elliott, Bill (22 July 2007). "As Woods slips, the steel of Europe is revealed". The Guardian. London. Retrieved 22 May 2010. ^ a b c Parsons, Chris (20 June 2011). "Thanks Dad: The best Father's Day present ever as golf's new superstar dedicates stunning U.S. Open victory to his parents". Daily Mail. London. Retrieved 20 June 2011. ^ "Welcome to Holywood Golf Club". Retrieved 30 November 2011. ^ "News & Events". PGA of America. Archived from the original on 18 March 2012. Retrieved 19 June 2011. ^ "Golf: Rory McIlroy wins the Irish Close". Indigo.ie. Retrieved 19 June 2011. ^ Ryan, Eoin (6 May 2011). "Cutler and Dunbar lead Irish Close Championship field". Teetotal.ie. Archived from the original on 9 May 2012. Retrieved 30 November 2011. ^ Wolken, Dan (19 June 2011). "Prized Recruit: College golf coach reflects on the one who got away". The Daily. Retrieved 21 June 2011. ^ "The 2007 Open Championship News". PGA of America. Retrieved 19 June 2011. ^ "Golfing sensation sets new record". BBC News. 13 July 2005. Retrieved 22 May 2010. ^ "The R&A – The World Amateur Golf Ranking Homepage – Men's and Women's golf rankings". wagr.randa.org. Retrieved 19 June 2011. ^ "Official Website of the 2007 Walker Cup Match". WalkerCup.org. Retrieved 19 June 2011. ^ "The R&A". Walker Cup. Archived from the original on 10 September 2007. Retrieved 19 June 2011. ^ "Rory McIlroy, News, Stats, Biography & Tournament Info". Imaginegolfclub.com. Archived from the original on 10 September 2011. Retrieved 30 November 2011. ^ "Rory McIlroy splits from agent". Golf International Magazine. 27 January 2010. Archived from the original on 25 April 2012. Retrieved 30 November 2011. ^ "2007 Season". PGA European Tour. Retrieved 8 August 2013. ^ a b c "Rory McIlroy Biography". Monstersandcritics.com. Archived from the original on 20 August 2013. Retrieved 8 August 2013. ^ "The 2011 PGA Championship – Profiles". PGA of America. 11 August 2011. Retrieved 30 November 2011. ^ "McIlroy says no to Tiger, he's too busy!". The Belfast Telegraph. 15 November 2007. ^ "McDowell in contention after 66". BBC Sport. 16 November 2007. Retrieved 22 May 2010. ^ "Official World Golf Ranking – Week 4 – 27 January 2008" (PDF). Retrieved 30 November 2011. ^ "Nervy McIlroy misses chance for European Masters success". The Guardian. London. 7 September 2008. Retrieved 21 August 2012. ^ "Official World Golf Ranking – Week 44 – 2 November 2008" (PDF). Retrieved 21 August 2012. ^ "Official World Golf Ranking – Week 47 results – 23 November 2008" (PDF). Retrieved 30 November 2011. ^ "Official World Golf Ranking – Week 47 – 23 November 2008" (PDF). Retrieved 30 November 2011. ^ "Official World Golf Ranking – Week 52, 31 December 2008" (PDF). Retrieved 30 November 2011. ^ "Week 5 – Kenny Perry Wins The FBR Open And He Claims His Spot in the World Top 10". OWGR. Archived from the original on 20 August 2013. Retrieved 19 June 2011. ^ "World Golf Championships-Accenture Match Play Championship – Rory McIlroy Scorecard". PGA Tour. 28 February 2011. Archived from the original on 4 June 2011. Retrieved 19 June 2011. ^ a b c d e f g h "Season Results". PGA Tour. ^ "Driving Distance Leaders – 2011 Masters Tournament". Masters.com. Retrieved 19 June 2011. ^ a b "Results – 2009". PGA European Tour. ^ "Week 47 – Lee Westwood Wins The Dubai World Championship, The Race To Dubai And Moves To World Number Four, One of Six Europeans in the World Top10". OWGR. Archived from the original on 24 May 2012. Retrieved 30 November 2011. ^ "Official World Golf Ranking – Week 52, 31 December 2009" (PDF). Retrieved 30 November 2011. ^ Reason, Mark (18 November 2009). "Rory McIlroy's self motivating qualities makes him favourite for the Race to Dubai". The Daily Telegraph. London. Retrieved 9 November 2010. ^ "McIlroy pulls out of NGC". Sport24.co.za. Retrieved 30 November 2011. ^ "Rory McIlroy – Tiger-esque Performer, Extraordinary Player Leading US Open Golf 2011". The Sports Herald. 19 June 2011. Archived from the original on 27 June 2011. Retrieved 30 November 2011. ^ "Golf – NI golfer Rory McIlroy set for back injury scan". BBC Sport. 8 February 2010. Retrieved 30 November 2011. ^ "Quail Hollow Championship – Notebook: Round 4". PGA Tour. 2 May 2010. Retrieved 19 June 2014. ^ "Rory McIlroy breaks record to win maiden PGA Tour title". BBC Sport. 2 May 2010. Retrieved 4 May 2010. ^ "PGA Tour – All-Exempt Tour Priority Rankings". PGA Tour. Retrieved 19 June 2014. ^ "Chris Riley, Rory McIlroy grab first-round lead at Memorial". USA Today. 2 June 2011. Retrieved 30 November 2011. ^ "The Memorial Golf Leaderboard is headed by Rory McIlroy and Chris Riley". Golfblogger.co.uk. 2 June 2011. Archived from the original on 4 April 2012. Retrieved 30 November 2011. ^ Rainbird, Miranda (11 April 2011). "Phil and Tiger: The Rivalry: Rory McIlroy – biggest collapse ever". Philandtiger.blogspot.com. Archived from the original on 30 March 2012. Retrieved 30 November 2011. ^ "Ladbrokes – The Open". Ladbrokes.teamtalk.com. Archived from the original on 25 April 2012. Retrieved 30 November 2011. ^ "Rory McIlroy". Enotes.com. Retrieved 30 November 2011. ^ "Rory McIlroy to focus on European Tour rather than PGA". BBC Sport. 9 November 2010. Retrieved 9 November 2010. ^ Donegan, Lawrence (1 April 2012). "Rory McIlroy: Andrew 'Chubby' Chandler led me down the wrong path". The Guardian. London. Retrieved 1 April 2012. ^ "The Masters 2011: Rory McIlroy leads after magnificent opening round of 65 at Augusta". The Daily Telegraph. London. 7 April 2011. Retrieved 30 November 2011. ^ "Rory McIlroy Wins U.S. Open to Become Youngest Champion in Nearly a Century". ABC News. 20 June 2011. Retrieved 30 November 2011. ^ Lawrenson, Derek (11 April 2011). "McIlroy's Masters dream ends in tears as three holes from hell hand Schwartzel the Green Jacket". Daily Mail. London. ^ "U.S. Open records set by champion McIlroy". Yahoo Sports. 20 June 2011. Retrieved 4 July 2011. ^ Garside, Kevin (20 June 2011). "Rory McIlroy illuminates Congressional with record-breaking performance". The Daily Telegraph. London. Retrieved 20 June 2011. ^ "Rory McIlroy wows American press with US Open triumph". The Guardian. London. 20 June 2011. Retrieved 20 June 2011. ^ "Week 25 – Rory McIlroy Wins The US Open in Record Breaking Style And Climbs To World Number 4". OWGR. 20 June 2011. Archived from the original on 4 April 2012. Retrieved 26 June 2011. ^ Scrivener, Peter (17 June 2011). "US Open second round at Congressional as it happened". BBC Sport. Retrieved 20 June 2011. ^ "Capital Offense: McIlroy (11 Under) Running Away From Field At Midway Point". USOpen.com. Archived from the original on 21 June 2011. Retrieved 19 June 2011. ^ Murray, Scott (18 June 2011). "US Open 2011: day three – as it happened". The Guardian. London. Retrieved 20 June 2011. ^ "US Open 2011: Remarkable Rory McIlroy wins by eight shots". The Guardian. London. 20 June 2011. Retrieved 4 July 2011. ^ Bensch, Bob (7 July 2011). "Rory McIlroy Says He Needed to Take Break After Record U.S. Open Victory". Bloomberg L.P. Retrieved 30 November 2011. ^ "Rory McIlroy struggles to a 74, tries to keep his hopes up". USA Today. 16 July 2011. Retrieved 30 November 2011. ^ "After the PGA Championship, he has finished in the top three of his next four events worldwide". PGA of America. Archived from the original on 25 April 2012. Retrieved 30 November 2011. ^ "Shanghai Masters Golf Tournament 2011 Final Round". realsportingnews.com. 30 October 2011. Retrieved 31 October 2011. ^ "Rory McIlroy becomes world number one after Honda win". BBC Sport. 4 March 2012. Retrieved 4 March 2012. ^ "Rory McIlroy eager to retain world number one ranking". BBC Sport. 5 March 2012. Retrieved 5 March 2012. ^ Chronnell, Paul (6 May 2012). "Rory McIlroy is world No. 1 again despite play-off loss to Rickie Fowler". The Guardian. London. Retrieved 6 May 2012. ^ a b Shain, Jeff (13 August 2012). "Eight is more than enough for Rory McIlroy to win the PGA". Los Angeles Times. Retrieved 13 August 2012. ^ a b Pennington, Bill (12 August 2012). "McIlroy Dominates Another Major". The New York Times. Retrieved 13 August 2012. ^ a b Murray, Ewan (12 August 2012). "Rory McIlroy surges to brilliant victory in US PGA at Kiawah Island". The Guardian. London. Retrieved 13 August 2012. ^ Callahan, William S. (4 September 2012). "Rory McIlroy's sigh of relief after grinding out third success of year in US". Irish Independent. Retrieved 5 September 2012. ^ "Rory McIlroy wins BMW Championship in Indiana". BBC Sport. 9 September 2012. Retrieved 11 September 2012. ^ Corrigan, James. "BMW Championship 2012: Rory McIlroy records second win in a week and his third in four events at Crooked Stick". The Daily Telegraph. London. Retrieved 9 September 2012. ^ a b "Team Europe Profile: Rory McIlroy". www.rydercup.com. ^ Harig, Bob (30 September 2012). "Rory McIlroy barely makes tee time". ESPN. Retrieved 26 December 2015. ^ "McIlroy signs off in style". PGA European Tour. 25 November 2012. Retrieved 26 November 2012. ^ "Rory McIlroy – PGA Golfer – 2013 Player Profile". Rotoworld.com. Retrieved 8 August 2013. ^ "Rory McIlroy wins Australian Open by one shot from Adam Scott". BBC Sport. 1 December 2013. Retrieved 2 December 2013. ^ McEwan, Michael (20 January 2014). "McIlroy denied win by two-shot penalty". bunkered. Retrieved 20 January 2014. ^ Corrigan, James (25 May 2014). "Rory McIlroy wins BMW PGA Championship to end emotional week on a high". The Daily Telegraph. London. Retrieved 26 May 2014. ^ Hodgetts, Rob (20 July 2014). "Rory McIlroy wins third major title at 2014 Open Championship". BBC Sport. Retrieved 20 July 2014. ^ Jurejko, Jonathan (11 August 2014). "US PGA: Rory McIlroy battles back at Valhalla to win his fourth major". BBC Sport. ^ Corrigan, James (6 August 2014). "US PGA Championship 2014: Jack Nicklaus says Rory McIlroy can beat his record of majors". The Daily Telegraph. London. ^ "Rory McIlroy matches Dubai record". ESPN. 3 February 2015. ^ Gola, Hank (27 February 2015). "Rory McIlroy fires a 74 to miss cut at Honda Classic - a first since 2013 British Open". New York Daily News. ^ "Masters 2015: Jordan Spieth wins first major with dominant display". BBC Sport. 13 April 2015. ^ "Rory McIlroy wins WGC Match Play by beating Gary Woodland". BBC Sport. 3 May 2015. Retrieved 15 May 2015. ^ Corrigan, James (4 May 2015). "Rory McIlroy claims piece of history with WGC Match Play triumph". The Daily Telegraph. ^ "Rory McIlroy leads Wells Fargo after course record 61". BBC Sport. 16 May 2015. ^ "Rory McIlroy's record victory at Wells Fargo Championship". BBC Sport. 18 May 2015. Retrieved 19 May 2015. ^ Corrigan, James (22 May 2015). "Rory McIlroy almost relieved to miss Wentworth cut". The Daily Telegraph. ^ "Irish Open: Rory McIlroy misses the cut for the third year in a row". Sky Sports. 30 May 2015. ^ "McIlroy welcomes break after dismal show in bad weather sees him crash out of Irish Open". The Daily Mirror. 29 May 2015. ^ Corrigan, James (6 July 2015). "Rory McIlroy ruptures ligaments in a football kickabout - and is now a major Open doubt". The Telegraph. ^ "Rory McIlroy - PGA Tour Schedule for 2015". ^ Medlock, Will (18 November 2015). "Who can win Race to Dubai?". Golf Monthly. ^ "World Tour Championship: Rory McIlroy wins to wrap up Race to Dubai". BBC Sport. 22 November 2015. ^ "Rory McIlroy named European Tour Golfer of the Year". BBC Sport. 15 December 2015. ^ Inglis, Martin (7 March 2016). "Rory McIlroy slams very frustrating round". bunkered. ^ Inglis, Martin (11 April 2016). "Rory McIlroy affected by Grand Slam pressure". bunkered. ^ Inglis, Martin (23 May 2016). "Rory McIlroy fights tears after Irish triumph". bunkered. ^ "€1.37m richer! Rory McIlroy ends PGA Tour win drought with storming 65 to take Deutsche Bank Championship". Independent. 9 May 2016. Retrieved 2 December 2016. ^ Murray, Ewan (26 September 2016). "Rory McIlroy scoops FedEx Cup glory to give Europe Ryder Cup momentum". The Guardian. Retrieved 28 September 2016. ^ "Reed Beats McIlroy in Epic Sunday Singles Battle at Ryder Cup". Golf.com. 2 October 2016. Retrieved 15 October 2016. ^ Murray, Ewan (9 May 2017). "Rory McIlroy signs $100m TaylorMade deal before Players Championship". The Guardian. Retrieved 11 March 2019. ^ "McIlroy's MRI shows recurrence of rib injury". Golf Channel. 15 May 2017. Retrieved 11 March 2019. ^ Harig, Bob (13 January 2018). "Rory McIlroy says rib injury is fine, but reveals heart irregularity issue". ABC News. Retrieved 11 March 2019. ^ Inglis, Martin (13 January 2018). "Rory McIlroy plays down heart irregularity". bunkered. ^ Murray, Ewan (18 March 2018). "Rory McIlroy claims Arnold Palmer Invitational with stunning last round". The Guardian. Retrieved 27 March 2018. ^ Porter, Kyle (9 April 2018). "Masters 2018: Rory McIlroy comes up short in his best shot at the career Grand Slam". CBS Sports. ^ Murray, Scott (22 July 2018). "The Open 2018: Francesco Molinari wins title on day of drama – as it happened". The Guardian. ^ Press, The Canadian (30 September 2018). "Europe wins back Ryder Cup, beating US 17 1/2-10 1/2". thespec.com. Retrieved 29 October 2018. ^ Corrigan, James (17 March 2019). "Rory McIlroy silences critics with superb Players Championship triumph". The Daily Telegraph. Retrieved 18 March 2019. ^ "Rory McIlroy 'honoured' to be nominated for Laureus Sportsman of the Year Award". Laureus. 3 October 2016. ^ Diaz, Jaime (29 June 2010). "Guru Wars: Some candid talk about the short game and putting from Dave Stockton, Dave Pelz and Stan Utley". Golf Digest. Retrieved 12 November 2018. ^ "US Open champion McIlroy splits with ISM after four years in Chubby's stable". Daily Mail. London. 21 October 2011. Retrieved 15 June 2012. ^ "Rory McIlroy splits with manager Andrew Chandler". BBC Sport. 21 October 2011. Retrieved 15 June 2012. ^ "Horizon Sports Management". Horizonsports.ie. Retrieved 30 November 2011. ^ "Rory McIlroy's coach Michael Bannon to go full-time". BBC Sport. 14 June 2012. Retrieved 15 June 2012. ^ a b "Ryder Cup spot not a McIlroy goal". BBC Sport. 13 May 2009. Retrieved 8 November 2012. ^ Otway, Graham (15 May 2009). "Teenage sensation Rory McIlroy delivers Ryder Cup snub to Monty". Daily Mail. Retrieved 8 November 2012. ^ "Rory McIlroy admits regret over calling Ryder Cup 'an exhibition' event". The Guardian. Press Association. 21 September 2010. Retrieved 8 November 2012. ^ Crouse, Karen (1 March 2013). "McIlroy Walks Out as Concern Creeps In". The New York Times. Retrieved 8 April 2013. ^ "Rory McIlroy hurls golf club into the water at Cadillac Championship". The Daily Telegraph. 7 March 2015. ^ "Rory McIlroy throws club into lake at the WGC-Cadillac in Miami". BBC Sport. 6 March 2015. ^ Clarke, Harry (12 July 2016). "'I won't watch golf at Olympics, I will watch the sports that matter' – Rory McIlroy". Irish Independent. Retrieved 16 July 2016. ^ "Rory McIlroy admits he was wrong about golf at the Olympic Games". Daily Telegraph. 24 August 2016. Retrieved 2 October 2016. ^ Kimmage, Paul (8 January 2017). "Paul Kimmage meets Rory McIlroy: The truth about the Olympics, close friendship with Tiger and the important things in life". Irish Independent. Retrieved 11 January 2017. ^ "Rory McIlroy Tipped For Golfing Riches". Sky News. Retrieved 20 June 2011. ^ Crouse, Karen (17 May 2013). "McIlroy Charts a New Path, Again". The New York Times. Retrieved 31 July 2013. ^ Murray, Ewan (9 May 2017). "Rory McIlroy signs $100m TaylorMade deal before Players Championship". The Guardian. Retrieved 9 May 2017. ^ "Jumeirah Group ends sponsorship with Rory McIlroy". Golf.com. 8 January 2013. Retrieved 17 March 2019. ^ Good, Owen S. (16 March 2015). "EA Sports' golf video game returns as Rory McIlroy PGA Tour (update)". Polygon. ^ a b "McIlroy timeline: Road to long-awaited decision". The Irish Times (Dublin). 19 June 2014. Retrieved 19 June 2014. ^ "What they said: Rory McIlroy". PGA Tour. 4 March 2009. Retrieved 19 June 2014. ^ "Rory McIlroy hints he will play for Great Britain at Rio 2016 Olympics". Raidió Teilifís Éireann. 10 September 2012. Retrieved 10 September 2012. ^ "What they said: Rory McIlroy". PGA Tour. 2 May 2010. Retrieved 19 June 2014. ^ Stanage, Niall (10 July 2011). "Northern Ireland's McIlroy Transcends Boundaries". The New York Times. Retrieved 11 September 2012. ^ "Rory McIlroy in no rush to pledge allegiance to Ireland or Britain ahead of Rio 2016 Olympics". Raidió Teilifís Éireann. 11 September 2012. Retrieved 11 September 2012. ^ a b "Rory McIlroy opts to play for Ireland at the 2016 Olympics". BBC Sport. 18 June 2014. Retrieved 18 June 2014. ^ "Rory McIlroy: I may not play in Rio Olympics". BBC News. 3 January 2013. Retrieved 3 January 2013. ^ "Sneak a peek at Rory McIlroy's backyard course". BBC Sport. 4 July 2011. Retrieved 26 September 2012. ^ "Rory McIlroy puts Northern Ireland home up for sale for £2m". BBC News. 21 September 2012. Retrieved 26 September 2012. ^ Wall, Jonathan (8 December 2012). "Rory McIlroy buys swanky $10.9 million home in Florida". Yahoo Sports. Retrieved 14 January 2013. ^ "McIlroy to purchase $10.9 million Florida home". The Golf Channel. 8 December 2012. Retrieved 14 January 2013. ^ "Golf Star Rory McIlroy appointed UNICEF Ireland Ambassador". UNICEF Ireland. Archived from the original on 23 June 2011. Retrieved 19 June 2011. ^ Svrluga, Barry (10 June 2011). "Rory McIlroy puts U.S. Open prep on hold for 'inspiring' trip to earthquake-ravaged Haiti". The Washington Post. Retrieved 26 September 2012. ^ "Rory McIlroy's trip makes heartfelt impact – U.S. Open". ESPN. 14 June 2011. Retrieved 20 June 2011. ^ Costigan, Tyler (13 August 2014). "Rory McIlroy named ambassador for PGA Junior League Golf". Golf Canada. Archived from the original on 10 September 2016. ^ "Police to re-examine evidence in sectarian murder of Rory McIlroy's uncle". Irishcentral.com. Retrieved 30 November 2011. ^ "Rory McIlroy Profile". Sky Sports. Archived from the original on 24 June 2012. Retrieved 26 September 2012. ^ "Watch Man Utd fan Rory McIlroy get Booed by Liverpool crowd at the Open". Daily Express. Retrieved 29 July 2014. ^ "Rory McIlroy: I feared I had broken my ankle.. but I won't give up playing football". Daily Record. 26 September 2016. ^ "Rory McIlroy makes trip home to watch Ulster rugby match". BBC News. 20 April 2012. Retrieved 8 August 2013. ^ O'Connor, Ruaidhri; Farelly, Hugh (24 April 2011). "Ulster deny McIlroy is bankrolling province's big earners". Irish Independent. Retrieved 8 August 2013. ^ "No. 60009". The London Gazette (Supplement). 31 December 2011. p. 19. ^ "OBE for Darren Clarke and MBE for Rory McIlroy in New Year Honours list". BBC Sport. Retrieved 31 December 2011. ^ "Rory McIlroy". Forbes. 2017. Retrieved 8 May 2018. ^ Molloy, Thomas; Alexander, Steven (27 March 2015). "Rory McIroy will pay tax to Dublin government rather than HMRC". Belfast Telegraph. ^ Inglis, Martin (6 February 2018). "Rory McIlroy to star in episode of The Grand Tour". bunkered. ^ "McIlroy says arm fine, confirms dating Wozniacki". PGA Tour. 25 August 2011. Retrieved 19 June 2014. ^ "Rory McIlroy engaged to Wozniacki". ESPN. Associated Press. 31 December 2013. Retrieved 31 December 2013. ^ McBride, Caitlin; Byrne, Cormac (21 May 2014). "McIlroy claims Wozniacki split was 'amicable and mutual'". Irish Independent. Dublin. ^ "Caroline Wozniacki opens up over end of relationship with Rory McIlroy". The Guardian. London. 11 September 2014. ^ "Break point: The engagement between Caroline Wozniacki and Rory McIlroy is Off". evoke.ie. 21 May 2014. Archived from the original on 4 February 2015. Retrieved 4 February 2015. ^ "Rory McIlroy "very happy" with American girlfriend". Raidió Teilifís Éireann. 30 May 2015. Retrieved 19 August 2015. ^ "No divas here! Rory McIlroy and girlfriend Erica refuse VIP treatment at Titanic museum". evoke.ie. 24 June 2015. Archived from the original on 26 June 2015. Retrieved 25 June 2015. ^ "Rory McIlroy engaged to girlfriend Erica Stoll". Irish Independent. Retrieved 4 December 2015. ^ "Has she Stoll-en his heart? Rory McIlroy 'engaged to girlfriend' Erica". evoke.ie. 3 December 2015. Archived from the original on 8 December 2015. Retrieved 4 December 2015. ^ "First pictures from Rory McIlroy wedding - beaming mum and dad at Ashford Castle". Belfast Telegraph. 22 April 2017. ^ "Career Money List". European Tour. Retrieved 27 November 2018. ^ "Rory McIlroy – European Tour – Career Record Details". PGA European Tour. Retrieved 27 November 2018. ^ "Rory McIlroy". PGA Tour. Retrieved 25 September 2018. ^ "Rory McIlory - WITB 2019". GolfWRX. Retrieved 14 February 2019.